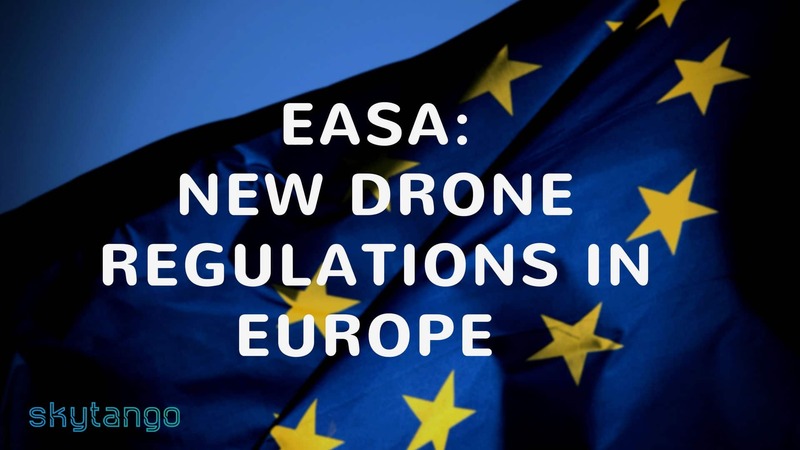 The European Aviation Safety Association (EASA) has advanced a new set of regulations for small drones flying over European territory. EASA proposal, released on May 5, 2017, has a clear objective: offering a unifying framework to safely operate drones in Europe while allowing the industry to remain agile and continue to grow. The document reviews most of the main concerns of the drone industry as it is today. according to the EASA press release. The proposed regulations for small drones in Europe covers both the technical and operational requirements to be fulfilled by UAV operators and drone manufacturers. On the technical requirements side, one of the most important element out of the proposal is to implement design requirements for small drones using the CE (“Conformité européenne”) marking. The well-known label will be used as a drone manufacturer’s declaration that the product complies with the requirements of the relevant European health, safety, and environmental protection legislation. Moreover, the identification class of the drone will also be displayed on the UAV next to the CE mark. European drone classes range from C0, for small recreational drones to C4 for the most advanced UAV uses. Finally, EASA created a do’s and don’ts of flying a drone leaflet. The proposal suggests including this concise guide of the relevant regulations to follow in each retail packaging for consumer drones. The goal of these additional identification and information processes is to instruct flyers on where they can operate their UAV, and on the required competence level for their desired operations. The proposal also requires any drone pilot operating a craft weighing more than 250g aircraft to register his drone with the relevant aviation body. On the operational requirements side, the proposed regulations for small UAVs also take into consideration the risk posed to other aircraft and people on the ground. Privacy, security and data protection issues created by flying such drones, are also addressed in the proposal given their significant place in the drone debate. For example, the rules foresee integrating automated geo-fencing within the drone software, which prohibits the entrance of unmanned aircraft into a restricted area. Moreover, an operational risk assessment will be carried out for drone operations that involve higher risk factors in order to specify the requirements that a pilot needs to comply with before flying the aircraft. If you need a recap, Drone Industry Insights offers a great visual of the drone rule-making progress both in EASA and USA. A large group of experts contributed to the building of the proposal published in a document called a Notice of Proposed Amendment (NPA). Contributors include representatives of the EASA Member States, the Unmanned Aircraft Systems (UAS) industry, UAS operators, aviation representatives and aeromodelling associations. This new proposal is also intended to serve as guidance for the European Union Member States that have no rules for small unmanned aircraft or plan to modify their existing ones, to ensure consistency as much as possible with the intent of the future EU rules. As such, the proposal allows for a high degree of flexibility for EASA Member States. For instance, they will be given the ability to define specific zones in their territory where either drones operations are prohibited or restricted (for example to protect sensitive areas), but also zones where few restrictions are in place. The proposal of EASA for new regulations for small drones will welcome comments from any interested party from May 12, 2017 until August 12, 2017. After this date, the agency will submit a final draft to be reviewed by the European Commission.